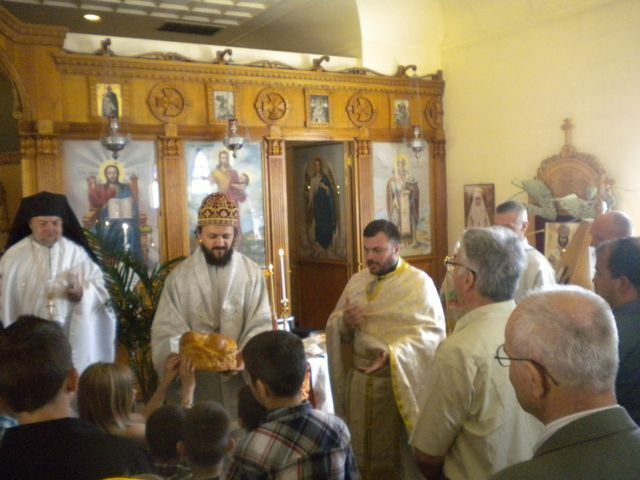 Boise, ID - On Bright Saturday, April 21, the Serbian Community in Boise, Idaho, celebrated its Slava – Holy Resurrection and received its Bishop who served the Divine Liturgy. His Grace, Bishop Maxim visited this Serbian Community with Rev. Presbyter Fr. Predrag Bojovic and prof. Bosko Bojovic from Paris, France. The Hierarchical Divine Liturgy started at 10.00 am, and some 120 people actively attended and participated in this Eucharistic event. Following the Holy Liturgy, there was a cutting of Kolach and a banquet. The host of the Greek Orthodox Parish of Saint Constantine and Helen, Fr. Nektarije Serfes, was extremely hospitable. He invited the Serbian Community to join his parish and participate in the sacramental life of the Church. The faithful were overjoyed with the this archpastoral visit and with the presentation of professor historian Bosko Bojovic who spoke on the subject: The heritage of the past and the challenges of the future. Fr. Nektarios Serfes, a great friend of the Serbian people, spoke again about his recent visit to Kosovo and Metohija and called upon the Serbian faithful to help their brothers and sisters in Kosovo. The event was beautified with the presence and dance of the folklore group and the visit of some 25 parishioners from St Archangel Michael church in Salt Lake City. The State of Idaho is a state in the Pacific Northwest region of the United States of America. Idaho was possibly named as the result of a hoax (the so-called "Idahoax"), although this is disputed. The exact origin of the name remains a mystery. The state's largest city and capital is Boise. Residents are called "Idahoans." Idaho was admitted to the Union on 3 July 1890 as the 43rd state. According to the United States Census Bureau, in 2007 the population for Idaho was 1,499,402. The state's postal abbreviation is ID . Idaho's nickname is the Gem State because it is one of only two places in the world where star garnets can be found (the other is the Himalaya Mountains, in India), and is the only place six pointed star garnets have been found. The state motto is Esto Perpetua (Latin for "Let it be forever"). Despite this lack of evidence for the origin of the name, many textbooks well into the 20th century repeated as fact Willing's account that the name "Idaho" derived from the Shoshone term "ee-da-how". The name "Idaho" may be derived from the Plains Apache word "idaahe?" which means "enemy." The Comanches used this word to refer to the Idaho Territory.